The Mayor of London has pledged £19K to Hello Hoxton High Street! Hello Hoxton High Street aims to make art an everyday part of life for local residents and visitors by making PEER Gallery much more inviting and accessible. The gallery, which occupies two single-glazed 1970s shop units that look onto Hoxton high street, is crowdfunding on Spacehive to dramatically transform their outward appearance. This will include a new single-entrance façade and installing internal see-through shutters so that exhibitions will still be visible at night and when the gallery is closed. 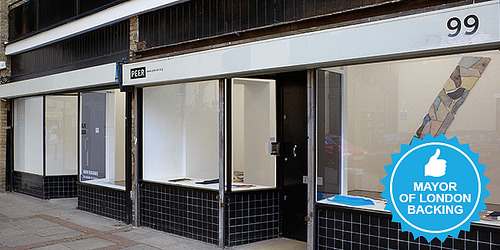 PEER has been based on Hoxton Street since 2002 and has exhibited more than 50 world-class artists, many of whom are Hackney residents. Having such a popular and valued space, and many local connections, crowdfunding seemed like the logical next step. To date, the project has attracted 180 backers and raised over £25,000 on Spacehive. Today the Mayor of London pledged £19,000 to Hello Hoxton High Street.